Just what everyone has been waiting for, another CPR vector analysis. I have at least two other CPR vector posts. 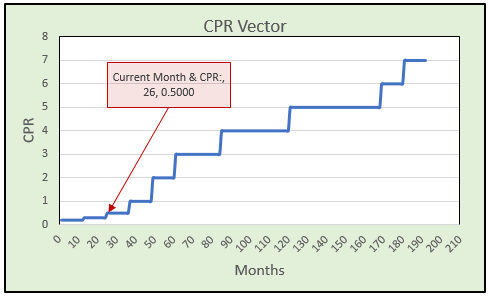 This one allows for your own CPR model, with CPRs potentially changing each year. I say potentially, because one could keep the same CPR for numerous years. First enter a description of the pool on sheet “Amortization”. The year column will ask for as many years CPRs as needed, so enter a CPR only next to a year. Back to Sheet “Amortization”, you will see the pool being amortized along with your monthly CPRs. Have you done any spreadsheet calculators that determine prices of Canadian NHA MBS? No, I have not. I had to Goolge Canadian NHA MBS. I noticed some interesting aspects, such as no prepayments on some types of loans. I know that the day counts are different on Canadian securities, than U.S. securities. Even if I knew the day counts and other differences, I would not know if the results matched the industry standards. Without any experience in these markets, and not knowing the nuances, it would be hard to give you correct results.